Last year I developed severe trouble walking and was falling frequently. I went for an MRI and was told I had Normal Pressure Hydrocephalus (NPH). After a few attempts at spinal taps I had ventricular peritoneal shunt surgery performed by Dr. William Cobb in Ridgewood, NJ in May 2015. Dr. Cobb’s nurse Lindsay Belfiore told me about the AlterG and suggested I try it as part of my post-op physical therapy. That brought me to SportsMed in Ho-Ho-Kus, New Jersey in early June. My physical therapist there Florentino (Tino) Ferrer created a program of balance and strengthening exercises for me that initially included 20 minutes of walking on the AlterG. Being able to see my stride on the three cameras was terrific biofeedback, and Tino did not have to correct me so frequently. After a few months of therapy my walking started to improve, but I was still having a lot of trouble on sloping surfaces (e.g., parking lots, hallways at work) especially when going downhill. My doctor agreed that that is particularly difficult for the brain, and he suggested seeing if there was a way I could practice downhill walking on the AlterG. Tino and an aide at SportsMed named Rosie put their heads together and figured out that I could practice walking downhill by running the AlterG in reverse on an incline and having me face backwards but walk forwards. I had to put the shorts on backwards but it all worked, and I saw improvement after only one session – that was so exciting! My routine on the AlterG since then has been to walk forward for 15 minutes at increasing rates of speed but no incline, then walk in reverse for 5 minutes, then switch everything around to face backwards and walk forward on a decline for 10 minutes. I wear 5 lb. ankle weights all the time on the AlterG. Now after working on the AlterG for 30 minutes a day three days a week for several more months, I am able to walk on my own on all kinds of surfaces (not perfectly yet, but I will get there!). Last month my neurosurgeon told me that I don’t have to see him again for a year. I still have a way to go before I can resume some of my old activities – step class in particular – so I am continuing my three-days-a-week routine with the AlterG and other balance exercises at SportsMed. I am very grateful to Dr. Cobb’s team, the SportsMed team and the AlterG team for helping me get to this point. Throughout this experience my husband Vince has also been a tremendous support – doing so many things that I couldn’t do for over a year and picking me up when I fell. When Valentine’s Day was approaching this year I was determined to get myself to a mall to buy him his favorite chocolates despite the walking involved. The expedition was a complete success: Vince was surprised, and we were both thrilled that I could manage it. Your miracle machine has been a major factor in my ongoing recovery, and all I can say is thank you for helping me get my independence back! 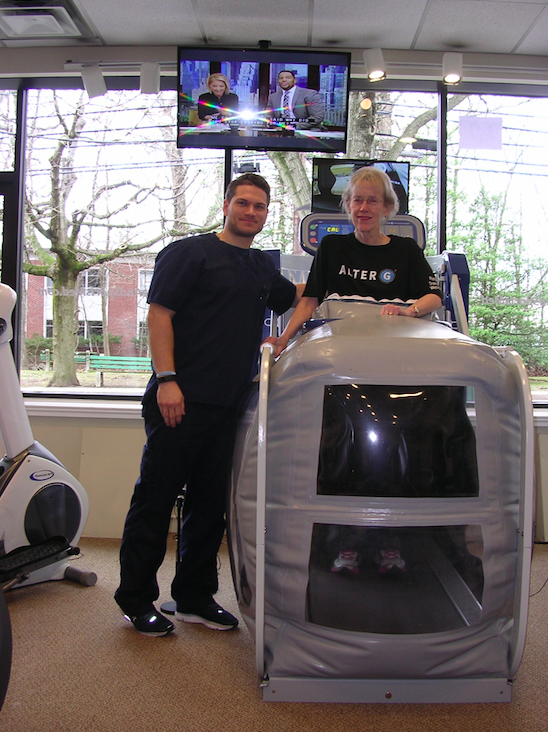 Trish, you put the “miracle” into our machine; our treadmill may take you to the moon, but it is our patients who turn those first “small steps” into giant leaps toward recovery. We are truly honored to take part in your rehab journey, and we salute your fearless resolve. To the rest of you fine folks, keep the gravity-free narratives coming! We are always looking for fresh material to share during our daily HQ story-time (right before naptime). So sharpen those pencils and ink those quills, and help send us off to some seriously inspirational mid-day dreams.